Kristie Tate '01 struggles to gain possession of the ball in a field hockey match against Middlebury College last Saturday. 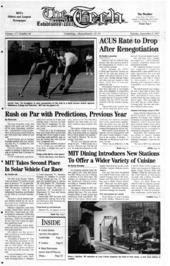 MIT lost the game 1-6. Outside hitter, Mayleen Ting '99, spikes the ball as her teammates block during Saturday's scrimmage in DuPont.